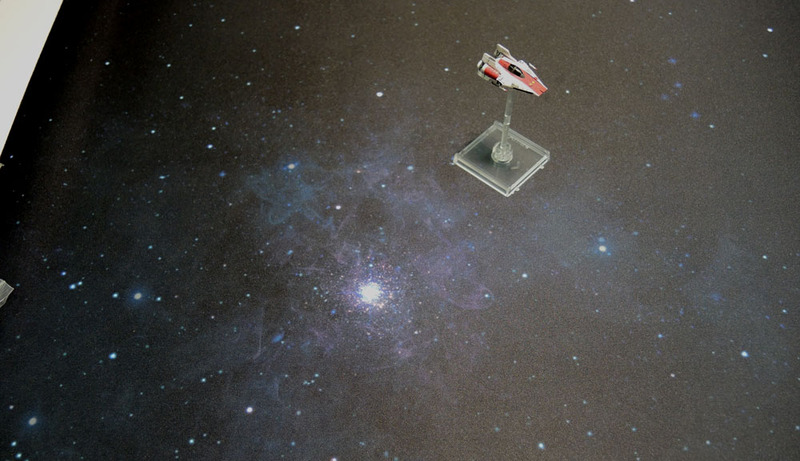 Reviews: Fantasy Flight Games’ X-Wing 3×3 Starfield Mat & Urbanmatz’ 6’x3′ Space Themed Game Mat. | Azazel's Bitz Box. 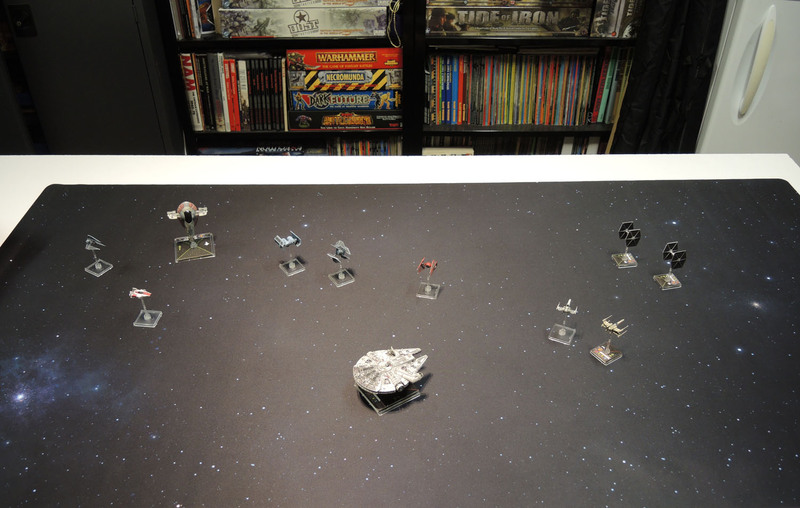 Reviews: Fantasy Flight Games’ X-Wing 3×3 Starfield Mat & Urbanmatz’ 6’x3′ Space Themed Game Mat. I am a casual player of X-Wing at best. I’d like to play more, but my limited free time is the biggest difficulty I have. I had a couple of starter sets, and a very respectable pile of additional ships. Regardless, shortly after the middle of 2016, I went on an X-Wing shopping rampage. I then followed that with a Star Wars Armada shopping rampage, buying a bunch of stuff for that game from scratch. I also picked up the official Starfield theme mat from a local game store for what I felt was a reasonable price. 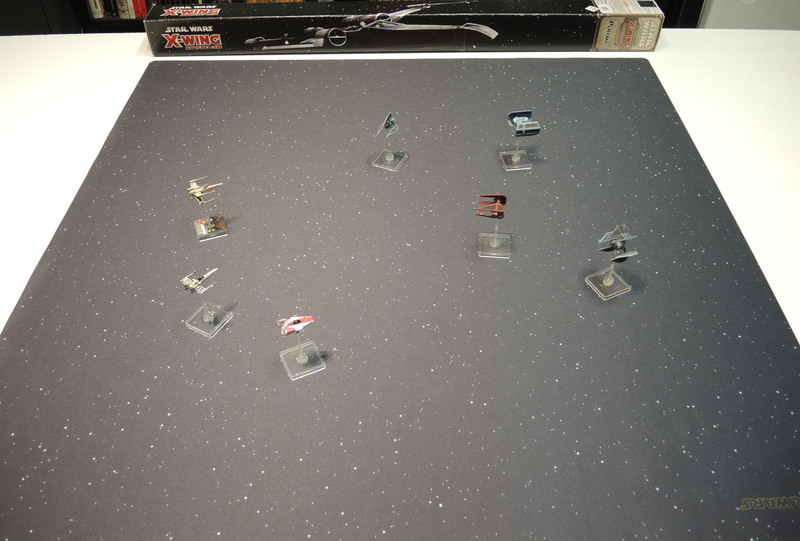 Fantasy Flight Games’ X-Wing 3×3 Starfield Game Mat. The glare is the result of my down spotlights. 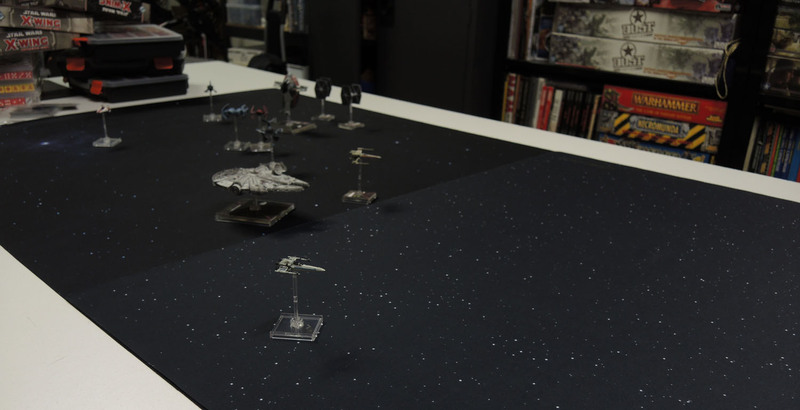 The FFG mat is on neoprene (mouse pad material) and is very nice. It’s the perfect size for basic games of X-Wing, and I assume, Armada as well (haven’t played it yet). I can see it also being useful for any other small-scale space games as well, as a Starfield is nice and generic. I’m thinking that it could potentially work really nicely for GW’s upcoming offering – Gangs of Commorragh as well. So we played X-Wing. We enjoyed the game and had fun. But with a decent sized trio of X-Wing fighter wings landing, as well as a solid pair of fleets for Armada, it was obvious that we’d need to expand the play area from the basic 3×3 to the next tier, which is officially 6×3. I looked around for options, and considered the Death Star Assault mat to place alongside the Starfield, but as cool as the Death Star looks, I felt it was more than a little too specific, and I wouldn’t want to be playing all of my larger games in the shadow of the Death Star, so I just kind of forgot about it for awhile. 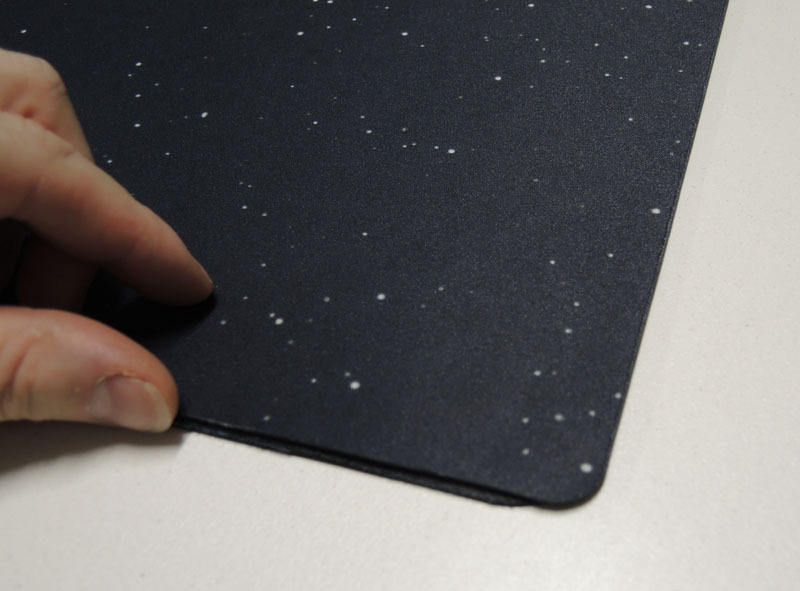 Urbanmatz’ 6×3 Space Mat. Once again, the glare in the centre is the result of my down spotlights. I enquired about mats that might suit my regular 28mm figures’ bases in a thread on Dakka, and Martin from Urbanmatz responded, suggesting that I take a look at one of his offerings. More on that later on, but in the end I placed an order for three mats from Urbanmatz, with VAT removed and the quantity making shipping much more reasonable than ordering one or two – Mighty Ape sells Urbanmatz’ mats individually for about AU$150 – the same price I can buy them direct from Urbanmatz from when paying shipping for each individual mat. Except Mighty Ape then adds their own shipping on top! Much cheaper to buy and support them directly and get a few mats a once to combine the shipping costs, so that’s what I did. The one we’re looking at in this review is obviously the Urbanmatz Space 6’x3′ mat. One of the larger stars with a subtle nebula around it on Urbanmatz’ Space mat. 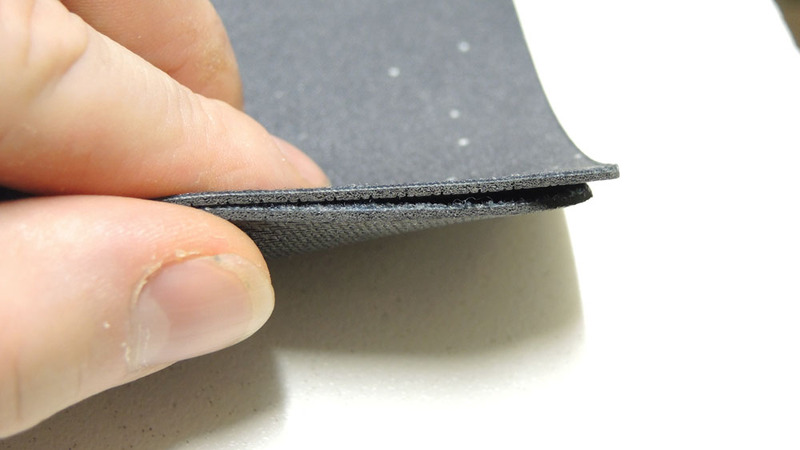 Martin also offered me a free damaged snow mat with my order, and I responded that I’d be quite happy to receive one. I’m mentioning this here both to be upfront about receiving a freebie, and importantly to point out that the (let’s face it) generous gesture from Martin doesn’t influence this review or my opinion on his mats at all, since it it were rubbish, I’d state as much. This is neither paid, nor a promotion, after all. After placing my order in November, I was emailed to let me know that they were out of stock of one of the styles I’d ordered, and would I like to change the mat, or get a refund, or just wait. Since I know how slowly my hobby stuff moves, and the state of the War Room (still not 100% cleared and cleaned up) I elected to wait – but I really do appreciate the email. I’ve had ordered from e-tailers have significant delays in shipping more than a few times, and usually I find that there’s no contact after a confirmation email. And then of course I get mightily pissed off at the wall of silence for weeks after placing an order. Getting emailed to ask what I want to do when an item is out of stock is a really nice bit of customer service in my opinion, and definitely something that mollifies my potential rage. So a pretty good shopping experience overall. The other larger stars on Urbanmatz’ offering. As can be seen, their biggest, brightest stars are still pretty subtle. So in mid-December my mats arrived, having been dispatched around the 6th via FedEx with tracking from the Czech Republic. On seeing the long, heavy box, my friend Pyrowave asked me what it was, and I responded by telling him it was a deactivated rocket launcher I’d purchased from the Czech Republic(!) I buy a lot of random gamer-ish crap, so it was actually sort of believable. To him, at least. 😉 Fast forward about a month until tonight, and I finally got the room cleaned up enough to lay out some mats on the gaming table. I opened up the Space Mat to take a look at it, and figured that I may as well take some photographs and review it, as well as the official mat at the same time. FFG on top, Urbanmatz below. Very, very close in thickness. 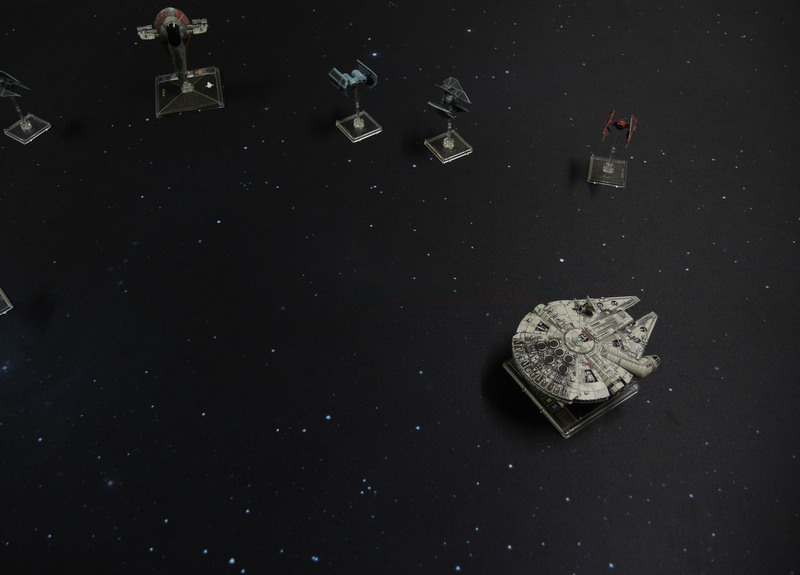 …and FFG’s X-Wing Starfield mat’s corner. Just a little more squared off, but still rounded. Urbanmatz left, Fantasy Flight right. 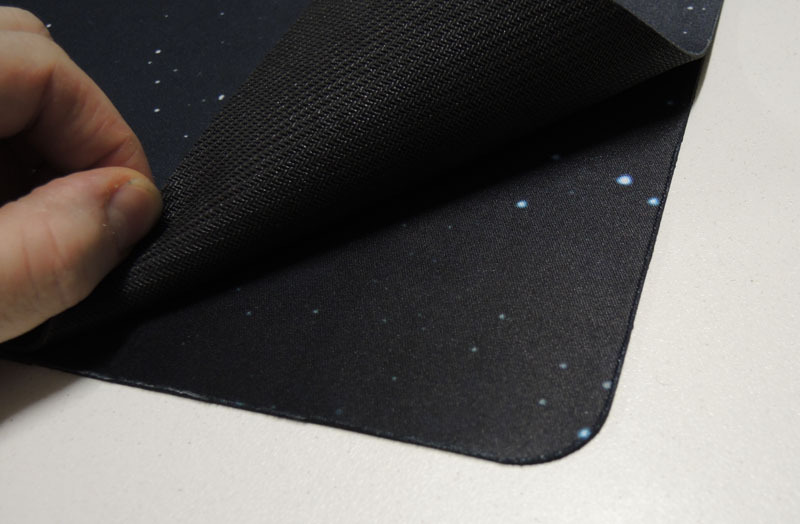 I really like the Urbanmatz Space mat. It’s on the same type of neoprene mousepad material as the official FFG Star Wars mat, but it feels a touch thicker and heavier, which I like. The starfield pattern is a little darker and feels richer in colour than the FFG mat, which by comparison is a little lighter. I think the UM mat seems richer and more colourful (despite being mostly just plain stars) is because of a slight bluish halo around some of the larger stars, which the FFG mat does not have. Corners are slightly different to the FFG in the way that they’re rounded off, but this doesn’t matter to me. 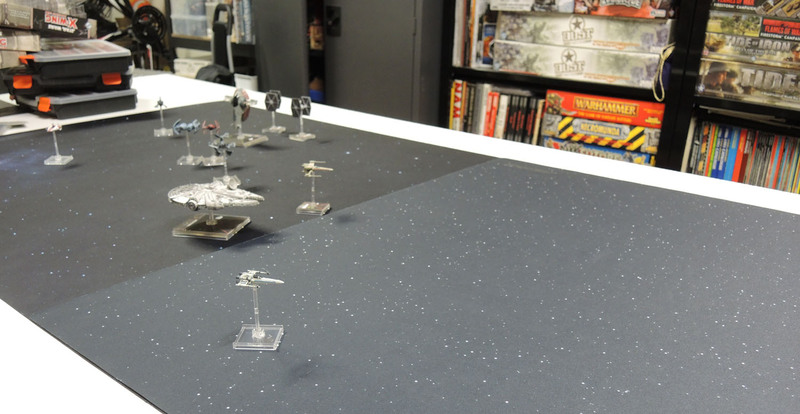 I think the FFG’s mat’s slightly squarer corners would work better when butting the mat up next to another one, like the Death Star or Bespin or whatever to create a 6×3 playing area, so it makes sense. On the other hand, the 6×3 is self-contained at that size, so it’s a non-issue. While we were laying the FFG mat on top of the UM one, Marouda commented that she thought the Urbanmatz mat looked a lot better, so it wasn’t just me. 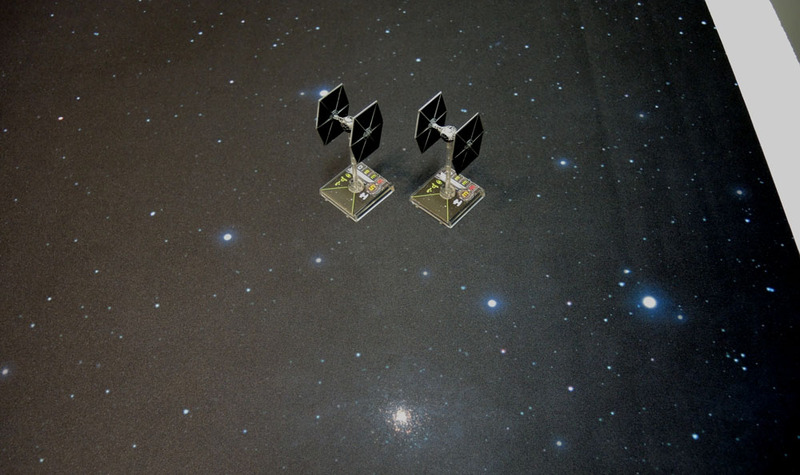 Urbanmatz’ Space 6×3 Mat on the left, overlaid with Fantasy Flight’s X-Wing Starfield 3×3 Mat on the right. You can see a fairly stark contrast between the two. Pretty much the same photo as above, but with the lighting adjusted to a much “truer” representation of the darkness of both mats. All in all, I’m very happy with both purchases and both products. 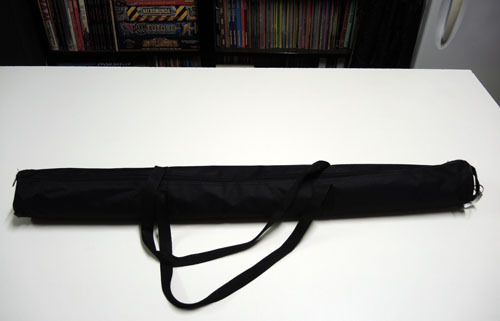 If I were going to “start again”, I’d buy my 3×3 from Urbanmatz, as I like their space mat more than the FFG one, and I also appreciate the carry bag that Urbanmatz’ product came with, as it’s better than the cardboard box that the FFG one came with – and miles better than the nothing that my Mantic mats came with, or the throw-it-away cardboard box my GW green-flock field mat came in. Having said that, I’ve got no regrets in having started with the FFG mat, and taken on its own still looks great. Both get a solid thumbs up from me, though I do give the edge to Urbanmatz’ product based on the “black” of space being darker and the “colour” of the mat feeling richer, the mat itself feeling slightly thicker and heavier – which I prefer – and the included carry bag. Urbanmatz’ mat bag. 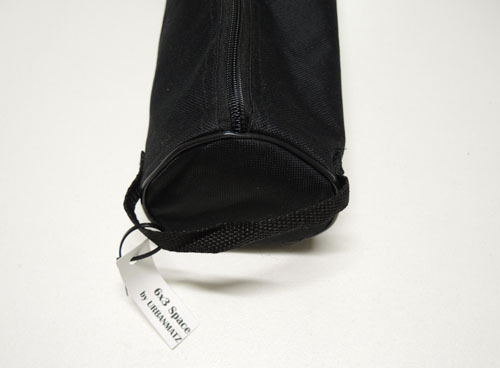 Comes with a full-length zip and some decent sized handles for carrying. Each of the ends comes with a loop handle, so I guess you could hang the bags, as well as a little tag to let you know which mat is inside. I’d love to see some kind of colourful nebula mat from Urbanmatz in the future. There are some amazing images out there of space, and a colourful one like that would be a great counterpart to the dark starfield. I’ll (hopefully) be reviewing the others I received in the next week or so – I haven’t even had a chance to open them up and look at them yet! This entry was posted in Game Mat Reviews, Product Reviews, Sci-Fi Gaming and tagged Fantasy Flight Games, Space Mat, Star Wars Armada, Star Wars X-Wing, Starfield Mat, Urbanmatz, Urbanmatz review, Urbanmatz Starfield, Urbanmatz X-Wing, urbanmatz.com, Wargame Mat. Bookmark the permalink. 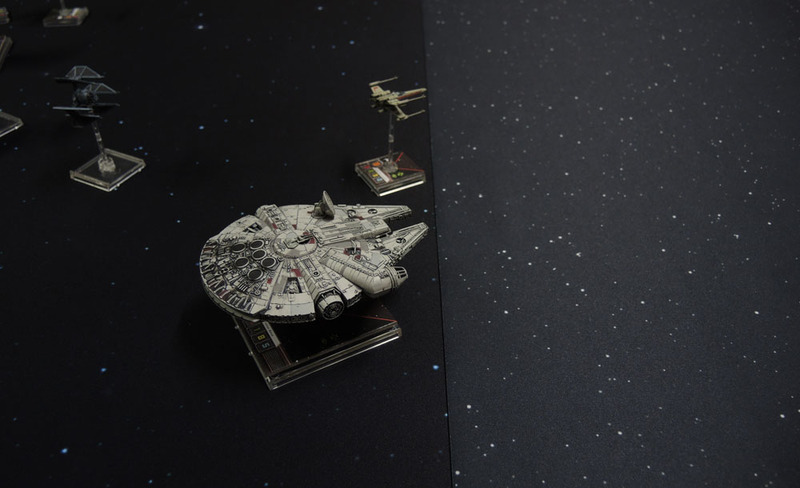 The mats look great – I like the look of the “blacker space” Urbanmatz more than the FFG. Some coloured stars or other phenomenom would be a nice addition. Agreed. The FFG one looks great until you compare it to the Urbanmatz one, which looks better. I’ll message them at some stage and suggest a more colourful space mat as a potential addition to their range. Thank you for the review. Well written, fair and balanced. I prefer the Urbanmatz one, too. The richer colours and the nebula just add to its appeal. You could print some planets or make some 3D-ones out of styrofoam balls, if you want to add some colour to your games. No problem. It’s obviously very important to be fair and balanced when reviewing anything, and much moreso when there’s been any kind of special treatment or freebie involved. There are some blogs that seem to constantly be pimping something or other, and at that point the perception of balance or objectivity completely disappears. I’m in a rough spot mentally as far as planetoids go for X-Wing and Armada-style games. I could make a bunch of ESB-style asteroids at some point, and just accept how unrealistic they are but I probably can’t suspend by disbelief far enough to have anything smaller than a basketball in an Armada game for a planetoid, and then the whole 3-d space issue happens. Pingback: Review: Urbanmatz’ 6’x4′ Snow Territory Game Mat. | Azazel's Bitz Box. 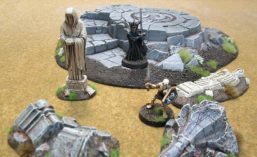 Pingback: Review: Urbanmatz’ 6’x4′ Badlands Game Mat. | Azazel's Bitz Box.